« Is Your Child Ready to Transition to Kindergarten Activities? The journey a dad will take with his “outside the box” child may be long and challenging. How and where will he find the support he needs? Any father-to-be experiences myriad emotions when contemplating his new role as a parent. Elation and excitement will likely give way to some level of anxiety, as he questions his ability to be a “good dad”. Questions like, “how will I financially support my growing family?” “Will I be able to find enough time in the day to work and be there for my family?” He might even fall asleep at night wondering if his child will be successful, get married, have children of their own. All of this might well be addressed with the creation of a “plan”. A roadmap that, if followed closely, will lead to the desired outcome. Done. But, what happens if a dad suddenly is faced with a major detour in that road? What happens when he receives a diagnosis for his child of a developmental delay, whether it’s sensory-processing based, speech related, or behavioral? It can be jarring and confusing, causing dad to go back and question his parenting choices, or feel guilt, fear, anxiety and anger. Ultimately, dad may even choose to deal with this by creating a new “plan”. But how? How to make things better – what to do – how to help? Now this certainly doesn’t apply to all men, but, according to gender research men have difficulty dealing with things they can’t fix or problems they can’t solve. When their usual problem solving methodology doesn’t work, they may feel powerless or inept. Add to this the emotions and fear of their spouse, the sense of aloneness, and the realization that some of the “dreams” they had may not turn out just as “planned”, what parent wouldn’t get overwhelmed? While a parent is a parent, no matter the gender, moms, dads and even siblings and grandparents will all deal with the diagnosis in their own way and at their own pace. No two people are the same, nor do they process and experience events in the same way. It would be unrealistic to expect two parents to understand and process a diagnosis and be “on the same page” all the time. A disconnect can occur when fear and anxiety about the child’s future, coupled with the sheer amount of extra work and patience it takes to deal with your child’s challenges, all feel like too much to bear. It would be shortsighted to think that support would come in a “one size fits all” form. The journey a dad will take with his “outside the box” child and the rest of his family may be long and challenging. There is much parents will have to decide and do together to achieve the best possible outcome. But while the need for teamwork is crucial, there is also room for individual support and guidance. The “dad will tough if out” mentality is no longer the norm, and our community realizes the need to acknowledge the dad’s perspective and offer solutions that he can relate to and apply in familiar ways. Whether dad is “stay at home”, primary care giver, tag-teammate or weekend warrior, joining a dads’ support group can bring camaraderie, patience, insightful information, new perspective and help focusing on the positive and the strengths of all involved. 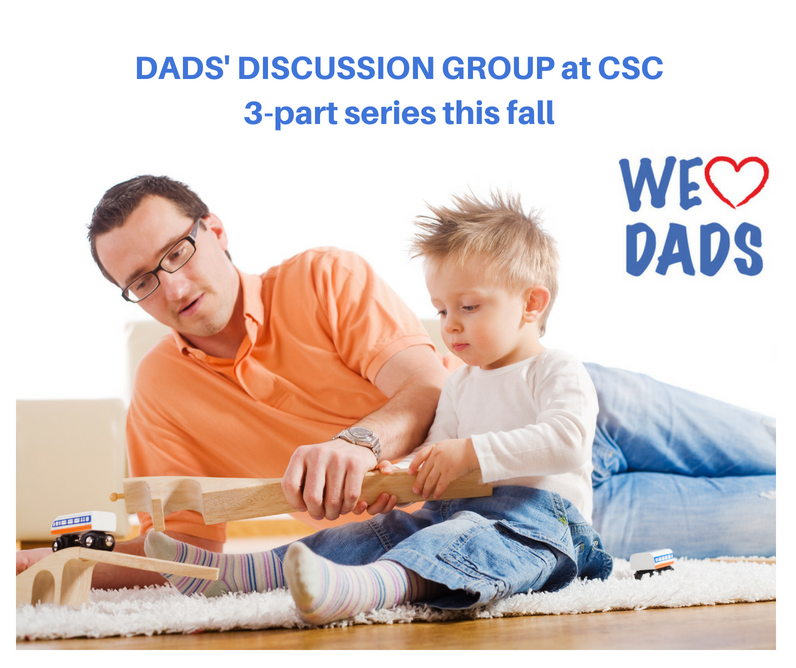 Child Success Center is presenting a Dads’ Discussion Group in a series of 3 evening sessions to be held this fall, designed to provide insights into self-care, ways to support your child and partner, information about diagnosis, provide camaraderie (you are not alone), and tools needed to maintain patience and a perspective of positivity. This feedback and coaching will be helpful to dads endeavoring to adjust to the new needs of his child and systems in place within the home and out. Learn more about this innovative new program and sign up today.